David was brought up on a mixed/dairy farm. The youngest of five, he trained as a Chartered Accountant and then moved in to industry. He spent over 40 years in the print and packaging industry which brought him up to Cumbria 30 years ago. From 2004, until he retired in 2015, David was CEO of the Innovia Group based in Wigton. Before retiring he proudly signed the contracts for the polymer substrate supply to the Bank of England and significant new investment in the Wigton site. 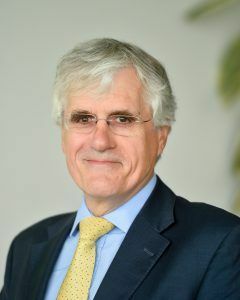 He is currently a mentor/coach to a number of people, Chair of Cumbria CBI, and also involved with start up companies all in the hope that his experience will be helpful. David has two children and two grandchildren. In his spare time he, and his other half Soo, can be found walking the fells, skiing, watching rugby and gardening. David was appointed as Chair of the trustees of Cumbria Community Foundation in December 2016.